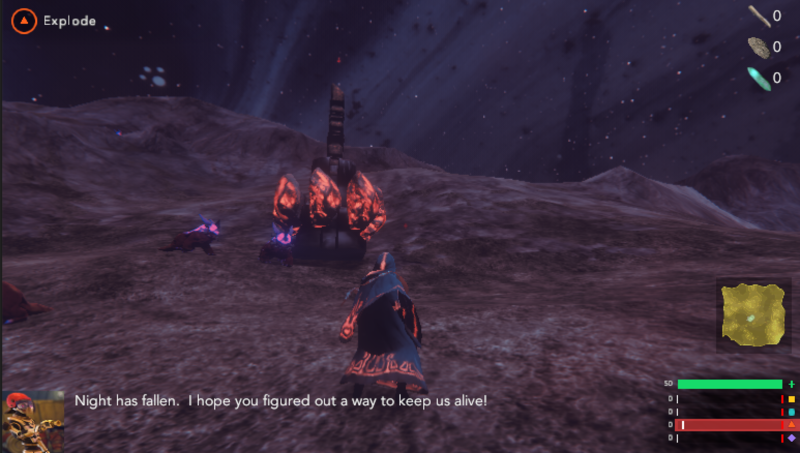 So there you can see the cool fire tower we've made, the ui for collectible things, night croakers coming to get me, and the npc chat dialogue. The chat dialogue will act as sort of a "tutorial" system as well as being able to convey story. Getting closer to an initial iteration of survival mode. Thanks all! Wow, great! This looks really neat! - "Fire tower"? Can it only cast fire spells? Will we be able to change their spells? Have multi-elements towers? So muuuuch questions! Thanks for all the love you give this game! Sorry for the late reply. We've been busy putting work into the vertical slice for survival/story mode. The NPC is actually your staff. We decided to make it sentient! A nightly release will probably happen next week. We have a few more bugs to knock out and then you will be able to try it out! I'm sure there will be more bugs of course.